The sign is big but the message still takes three iterations. This is the first. Things are moving along on the Linn County project to widen a section of Riverside Drive outside of Albany. Part of the road will be temporarily closed so the Knife River company can install more driveway culverts before tackling the paving part of the job next year. 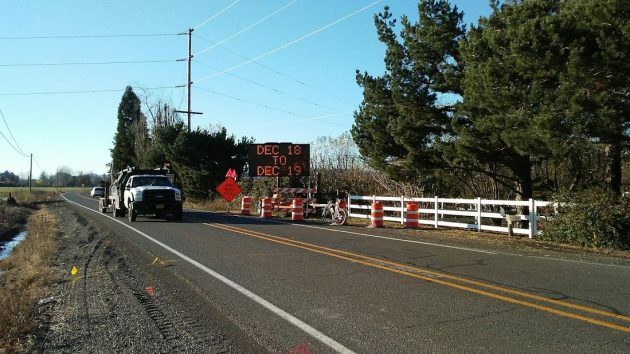 The county road department has begun notifying people of the closure, which will start Dec. 18 and require affected residents to take a detour to get to and from their homes. 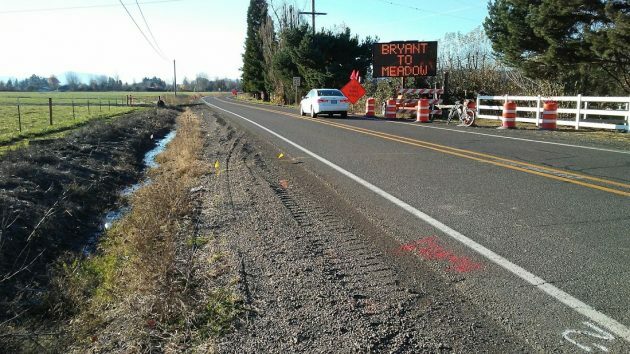 Commuters on this link between Albany and Highway 34 will have to take a different route as well. 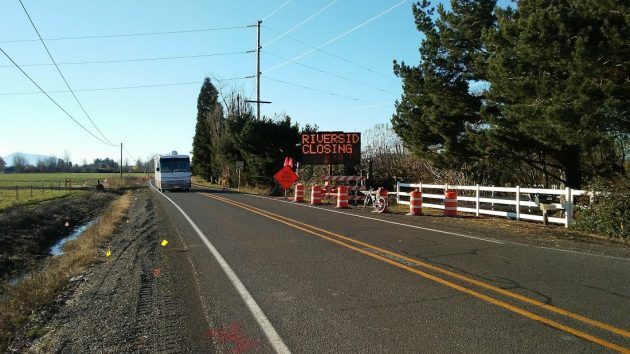 County Engineer Chuck Knoll said it makes sense to do the culvert work while the weather is unseasonably dry, which it has been for a few days. Also, schools will start their Christmas vacation on the 18th, so traffic should be naturally less. To refresh your memory, Knife River Corp. in Tangent has a $1.9 million contract to repave 2.4 miles of Riverside from Oakville Road just outside of Albany to Meadow Road. The contract has a completion date of June 22, 2018. The road is between 22 and 30 feet wide. The project calls for two 12-foot travel lanes and 4-foot paved shoulders on both sides, making a ribbon of pavement 32 feet wide. The shoulders will serve as bike lanes.